Boeing has unveiled its next-generation aircraft 787 Dreamliner. 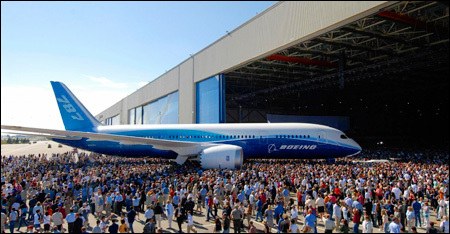 The premiere launch of the technologically advanced and environmentally progressive jetliner was held Sunday at Boeing's final assembly factory in Everett, Washington, U.S. The rollout ceremony, attended by 15,000 people including employees, airline customers and supplier partners, was broadcast live via satellite to more than 45 countries and through the Internet in nine languages. Boeing said the 787 premiere reached 100 million viewers, making it one of the largest corporate television and Internet broadcasts in history. B787 Dreamliner, the first commercial jet mostly made of composite materials, uses 20 percent less fuel than similar sized aircraft due to the light weight. It produces fewer carbon emissions and less noise at takeoff and landing. It can fly more than 15,700 kilometers _ with enough range for transpacific routes _ at a speed of Mach 0.85. ``The 787 Dreamliner is no longer a dream, it's a reality. With its advanced technologies, breakthrough economic and superior cabin environment for crew and passengers, the 787 is truly a new airplane for a new world,'' said Mike Bair, Boeing Commercial Airplanes' vice president and general manager of the 787 program. So far, 47 customers have ordered 677 Dreamliners worldwide, worth more than $110 billion. The first delivery is scheduled for May 2008 to ANA. In Korea, Korean Air is waiting for a delivery in 2009 with an aim to open new long-range routes. The carrier plans to use the 787s in developing new long-haul routes to South America and Africa, while using other long-range aircraft such as B777-200ER and B777-300ER for North America and Europe. Korean Air ordered 10 787s in April 2005, becoming a launching customer for the Dreamliner. ``We set up long-term fleet planning and ordered the aircraft when it was in the development stage in order to secure next-generation planes,'' a Korean Air official said. The carrier is also participating in manufacturing of the 787 _ the whole process from design to manufacturing and supply of six major parts of the aircraft including raked wingtip and aft body. In April, Boeing recognized Korean Air as the supplier of the year. ``We'll upgrade our fleet with next-generation planes through strategic investment. We'll adopt 40 state-of-the-art aircraft starting in 2009 along with the 10 B787s from 2009 and five double-decker A380s from 2010,'' the official said. In commemoration of the 787's rollout, Korean Air will offer flights on eight of its long-range routes for 787,000 won on the Internet, including flights to Los Angeles, Seattle, Zurich and Brisbane.